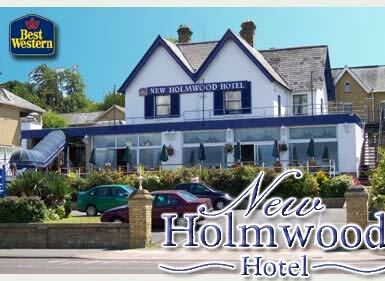 The New Holmwood Hotel is superbly situated on the edge of the Solent and offers the highest standards of decor, comfort and food. Whether you are having a well-earned short break, holiday or are away on business, the new Holmwood Hotel is here to welcome you. Cowes town centre - the sailing capital of the world is just a short walk along the esplanade, where you will find the Southampton to Cowes high-speed passenger ferry. Our deluxe and superior rooms have superb sea views, as does the dining room and lounge area, which lead onto the waterfront terrace, which stretches right across the length of the hotel. Here you can enjoy unrivalled panoramic views while you relax with a drink and a meal to watch the glorious sunsets and the sailing activities on the Solent. The Hotel also own two deep-water moorings approximately 250 feet offshore in front of the Hotel. The bedrooms are elegantly furnished and decorated and include en-suite facilities with bath and shower, direct dial telephone, hairdryer, tea and coffee making facilities, trouser press and television. There is an outdoor heated swimming pool with sun terrace and spa bath (summer only), licensed bar and three elegant lounges. We also have a purpose built conference and wedding suite, which caters for up to 150 guests. The New Holmwood is an extremely popular venue for weddings, small and large business meetings, training seminars, residential conference and exhibitions - tailor made to suit your requirements.